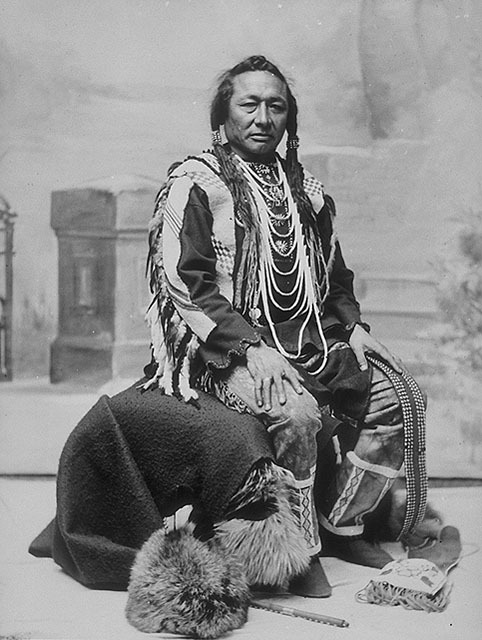 Big Bear (Mistahimaskwa) was born near Fort Carlton, present day Saskatchewan in 1825. His father appears to have been Black Powder, a headman of a mixed Saulteaux and Cree band and his wife was likely from the same band. It seems his parents may have both been Saulteaux, but he grew up among the Cree who spent their winters along the North Saskatchewan and hunted for buffalo in the south every summer. Accurate details of Big Bear’s status among the Cree before the 1870s are hard to support with clear evidence. He was referred to as the head Chief of a large group of Crees near Fort Carlton in 1862; however, in 1865, Hudson’s Bay Company trader John Sinclair thought he was the leader of a small group of Crees – perhaps only 20 men - mostly relatives, based near Fort Pitt. Like other Indians on the Canadian prairies at this time, Big Bear spent much of his time following the traditional pursuits of hunting and warring against other tribes, particularly the Blackfoot. In October 1870, he is known to have participated with his band in the Belly River Fight near Lethbridge, the last large scale intertribal battle in Canada, in which, if estimates are to be believed, 200-300 Crees and 40 Blackfoot may have lost their lives. Perhaps it was in the context of this significant loss of life that Big Bear came to more prominence amongst his people. By 1871, he was considered to be the leading chief and by 1873, he had more lodges in his following than Sweet Grass (Wikaskokiseyin), who had been named the Chief of the Country by the Hudson’s Bay Company in 1871. During the 1870s, he established a reputation as a diplomat and a peacemaker and tried to create a confederation of Indian bands to strengthen the tribes’ position in their dealings with the government. In 1876, he became the first major native leader to refuse to sign a treaty with the government when he rejected Treaty No. 6 and his position of independence drew others to his band. He made himself known among the Métis and the Canadian government as an independent man, clashing with Gabriel Dumont, the Métis leader over the way to hunt buffalo in 1873 and refusing presents from the HBC in 1874 for fear they were bribes to force them to participate in a future treaty. Perhaps he was exaggerating under Métis influence; though while it is true that the NWMP investigation of the claim found nothing came of the gathering, several thousand Indians and Métis did winter there, so it is feasible Crowfoot, Sitting Bull and one of the Métis leaders, Gabriel Dumont, all met with Big Bear to discuss the worsening situation on the Canadian plains. Riel, however, was living in exile amoing the Metis community in Montana and seems to have been more concerned with boosting his status on the south side of the border among his own people, their Cree, Assiniboin and Atsina allies and the American government. There is no evidence that he ever invited Sitting Bull to join in any kind of united front; indeed, his main concern was with the pressure that Lakota crossing back into Montana were putting on buffalo herds needed by his people and their Indian asscociates, so he tried to negotiate for the surrender of the Brules under Bull Dog and Red Elk and the Hunkpapa under Sitting Bull, who had developed close ties to Major Walsh and the NWMP and who wanted nothing of Riel’s self-serving plan. 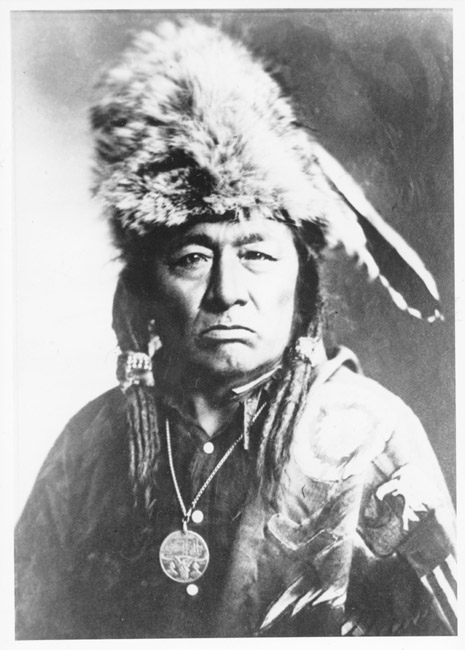 It is, however, also thought Big Bear attended the Lakota Sun Dance among Sitting Bull’s people in Canada in 1878 and 1879 in an attempt to consolidate the voices of the northern tribes and in 1879, he voiced his concerns over the disappearing buffalo and the inadequacy of the treaties to Commissioner Edgar Dewdney at Fort Walsh, but was unable to present a united front – Little Pine’s people were destitute and he signed and received rations immediately. Big Bear and party trading at Fort Pitt, 1884. L-R: Four Sky Thunder, Skybird, Matoose (sitting), Napasis, Big Bear, Angus McKay, Edward Dufresne, L. Goulet, Stanley Simpson, Rowley (seated), Alex McDonald (in rear), Corporal Sleigh, Mr Edmund, Henry Dufresne. The hats worn by he Indians were clearly popular trade items. Like many Indians on the Canadian plains, his band slipped into Montana to hunt, but by 1882, buffalo were so scarce that, for the good of his people, he was compelled to finally sign Treaty No. 6 at Fort Walsh, but he refused to give up his integrity: he insisted his band be relocated to Fort Pitt and continued to fight for the rights of the Cree. Travelling among the other Cree reserves, he noted the poor conditions and the limited agricultural success and he began to agitate on behalf of his people, stubbornly demanding to be moved to a different reserve, which resulted in having his rations cut off. He called on all the Cree leaders to help him work for one large Cree reserve on the North Saskatchewan and by June 1884, he had moved onto Poundmaker’s reserve with his 500 people and held a Thirst Dance (the Cree equivalent of the Sun Dance) attended by over 2000 people. Although this ceremony was banned by the government, it went ahead, but when a farm instructor abused a young warrior and refused to give him food, the Indian beat him. When 90 members of the NWMP arrived on the scene, despite their anger at the instructor, they attempted to arrest the Cree and it was only the intervention of Big Bear, Little Pine and Poundmaker that stopped bloodshed between the police and 400 or so warriors. Big Bear continued to urge a united stand against the Canadian government and spoke to gatherings of chiefs at Duck Lake and Carlton in late summer of 1884. arguing that the treaty they had signed had been altered, to the detriment of the Indians, and that they needed to argue with one voice and that the tribes should choose one representative every four years – he also claimed that Crowfoot thought along the same lines. His meetings in 1884 and 1885 with Louis Riel only served to deepen the government’s suspicions and nothing was done about Big Bear’s complaints which, in the end, led to the rise of the warrrior society, young men who would fight for change. Ironically, the government’s dealings – or lack of them – with the Cree drove some of them to an alliance with Riel. The Canadian west was abalze with panic and rumour. The New York Times carried a report that settlers and soldiers at Prince Albert was surrounded by Teton Sioux, even though there were only a few left north of the border; the Sioux who were involved were White Cap’s Wahpetons and Sissetons, who had been there since just after the Minnesota Uprising in 1862 and had worked for the past few years on farms and for local people in the Prince Albert area. By seizing his cattle and horses, the Metis coerced White Cap and twenty of his men to go to Batoche, but he sent a message to a white friend in Saskatoon, Dr. Gerald Willoughby, asking him for assistance. When the group reached Saskatoon, a group of nine citizens tried to persuade the Metis to allow White Cap to return to his reserve, but their attempt was unsuccessful. He was appointed the only Indian member of Riel’s council on internal matters, but this seems to have been a cosmetic move – perhaps an awkward sop to the Indians - on the Metis’ part, for he understood neither French nor Cree, and only attended one meeting. White Cap’s men were seen at the battles of Fish Creek and Batoche, but testimony provided by the main prosecution witnesses showed he could not be positively identified as having been among the several old Indian men at Batoche; however, it was mainly because of the evidence showing he had joined the Metis under duress that charges against him were dropped. When news came of the Metis’ victory over Superintendent Crozier of the NWMP at Duck Lake. Big Bear’s son, Little Bad Man, Little Poplar and a head warrior, Wandering Spirit, led a raid on the church at Frog Lake, killing first the Indian agent, Thomas Trueman Quinn, who they blamed for many of their problems, then eight other men, including two priests. Big Bear tried to intervene, but only two women and the HBC clerk escaped. When trader James Kay Simpson arrived on the scene that evening, he warned Big Bear that he would bear the brunt of the blame; the Cree replied, “It is not my doings, and the young men won’t listen, and I am very sorry for what has been done,” but his subsequent demonisation by the whites proved Simpson right. Wandering Spirit, 1885; from "The North-west Rebellion", by C. P. Mulvaney, 1886. I don't know if the sketch is based on life, unfortunately. Wandering Spirit, Little Bad Man and over 250 men turned their attention to Fort Pitt and once again, Big Bear tried to save lives, warning the garrison through an acquaintance, Sergeant J. A. Martin, “Try and get away before the afternoon, as the young men are all wild and hard to keep in hand.” Outnumbered, Inspector Dickens retreated with his men to Battleford while the 28 traders in the employ of the HBC surrendered to the Indians, who looted and burned down the fort. Troops under General Middleton, fresh from their success over the Metis at Batoche, pressed the Indians further. 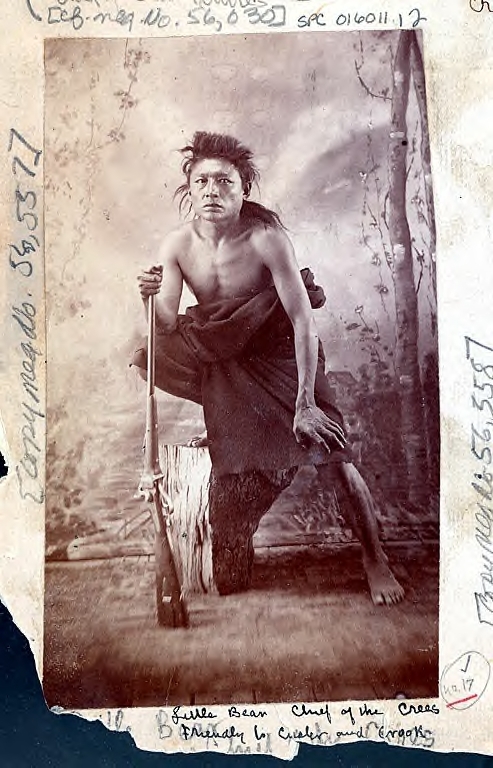 Little Bad Man fled to Montana; Wandering Spirit surrendered in November 1885 with five other men and they were hung for thir role in the Frog Lake killings. Big Bear gave himself up to the NWMP at Fort Carlton on 2 July 1885. With 14 of his band, he was charged with treason: levying war against the crown – the same charge that Poundmaker had been convicted of. White Cap was the only major Indian leader acquitted; Big Bear was found guilty “with a recommendation to mercy” and sentenced to three years in Stony Mountain Penitentiary, but his poor health and appeals by Crowfoot and others not involved in the ‘Rebellion’ saw him released in March 1887 onto the Poundmaker Reserve, his band having been scattered amongst other reserves. He died there in January 1888 and was buried in the Catholic cemetery, having been baptised in prison, possibly while he was ill. There seems to be some question as to whether Big Bear's second son - the one who split with his father and was a leader at Frog Lake - was called Little Bad Man or Little Bear. One reference on the Glenbow site has him also known as Little Poplar, but this was a different man from the war faction. Here are some photographs of him taken later life. There's no date, but judging from the photographs and bearing in mind Big Bear's age - 60 in 1885 - they're probably from the early 1900s. 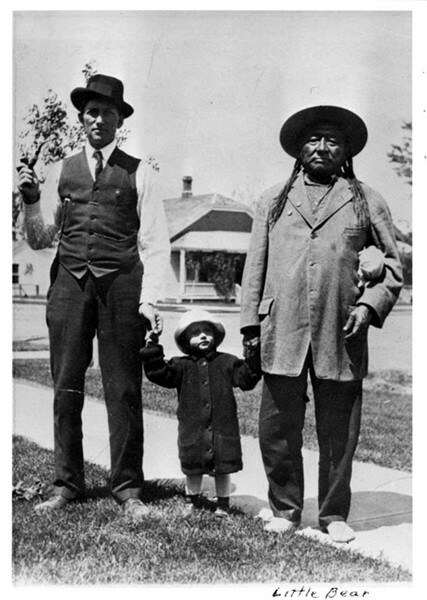 Little Bear in Havre with the remnants of Big Bear's people who fled to Montana as they await deportation to Canada in 1896. Most of them eventually returned to settle on the Rocky Boys Reservation southwest of Havre, Montana. Dutro-Reed Studio, photographer, MHS Photograph Archives, Helena. Thanks. I had the Lucky Man picture without recognising Little Bear. If that 'first' photo is the same man, it looks like it predates the first Big Bear photo by a decade. Either that, or he ages rapidly and puts on a fair bit of weight! I've looked through other photos of Canadian Indians from this period and I don't recognise he backdrop. Great photo. "The modern curio peddler, Little Bear, Chief of the Crees photo by Morris & Kirby, Chinnok, Mont. made in Germany." I´m not sure what "made in Germany" means in the DPL comment. rudy wiebe wrote a great book on Big Bear. There is also a two disc dvd canadian film called Big Bear that is really good with some great well known NA actors. I think you can get it on amazon. of course you may already know this but oh well! rudy also wrote ''a stolen life" the story of a cree woman that is a good read too. wow!! it is 179.00!!! what?? I'm glad i bought it years ago for reg price. maybe search around for a normal price. it is really a good movie. Unfortunately I haven´t seen the movie yet... but what´s interesting to me is that Tyron Tootoosis, who acted as Poundmaker in that movie, is a direct descendant of Yellow Mud Blanket, Poundmaker´s older brother. Tyron´s uncle, Gordon Tootoosis, acted as Big Bear. Here are a couple of photos relevant to this thread. This is Thunderchild, who split with Big Bear in 1879 after the latter refused to sign up to Treaty No. 6. 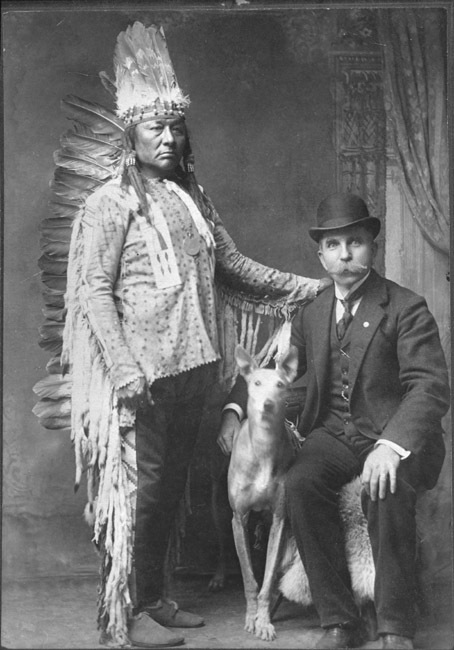 Althoigh he had originally rejected the treaty, the lack of buffalo and fresh food led to starvation and Thunderchild, with Lucky Man (see the photo posted by Dietmar, above), took close to half of Big Bear's people away from the Cypress Hills to form their own bands so they could receive rations. The photos are by a Mrs Moodie, taken in 1896; the medal he's wearing was recognition of his loyalty during the Riel Rebellion, but he remained a staunch proponent of his people's rights and a defender of traditonal religious values. 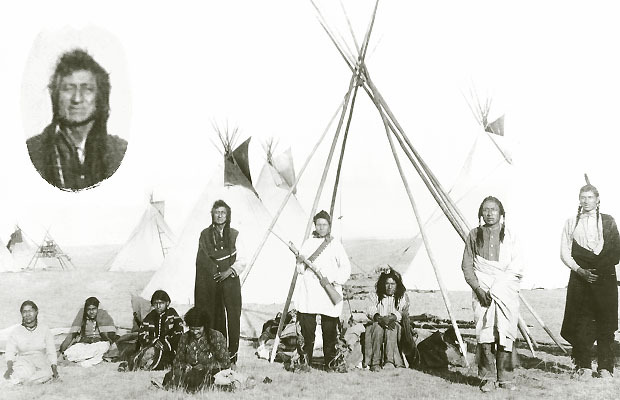 In this photo taken at the Moosomin Reserve in the 1890s, Thunderchild is the second man from the right. About Little Bear... Do you know if this was his actual name or did he come to be called that because his father was Big Bear? I ask because I've read somewhere that Big Bear's son involved at Frog Lake was called Little Bad Man and there was another Cree there who was called Little Bear and he was amongst those hung for his role in the affair. His Cree name is given as Apischaskoos. Hmm, I know that his name initially was Imasees and it was only later, after he went to Montana, that he called himself (or was called) Little Bear, perhaps just because his father´s name was Big Bear.